Tessa Novick is a third-year nephrology fellow at Johns Hopkins. Her research interests include social determinants of health, healthcare disparities, opioids, and illicit drug use in kidney disease. The numbers are grim and getting worse every year. Overdose deaths involving opioids continue to rise in men and women of all ages. According to the CDC, overdoses involving opioids killed more than 47,000 in 2017, the highest year on record; an estimated 19,000 of these deaths involved prescription opioids. We’ve seen three opioid “waves,” since the 1990s. The initial increase has been attributed to a four-fold increase in opioid prescribing between 1999-2010. In 2010, we saw an increase in deaths involving heroin, and since 2013, deaths involving synthetic opioids such as tramadol and illicitly manufactured fentanyl have been predominant. At the national level, opioid prescribing fell after 2010. In fact, in 2017 opioid prescriptions dropped to 58.7 per 100 persons, the lowest in 10 years. If prescription opioids are declining, the medical community is doing its part, right? It turns out opioid prescriptions are not declining in people with kidney disease. Evidence suggests opioid prescriptions in our patients are steady, even increasing in some geographic areas, and are higher than people without kidney disease. A recent study found that 49% of people with advanced chronic kidney disease (CKD) (eGFR <30 ml/min/1.73 m2) received an opioid prescription in 2016, compared to 29-31% of people with eGFR >60 ml/min/1.73 m2. The higher prevalence is likely because pain is common in kidney disease. An estimated 58% of patients with advanced CKD experience pain due to common co-morbidities such as peripheral vascular disease and diabetes, and pain syndromes unique to kidney disease such as osteodystrophy and calciphylaxis. NSAIDs are frequently avoided or even marked as an “allergy,” and Tylenol never seems to work. As a result, our patients continue to receive opioid prescriptions despite nationwide efforts and trends. To make matters worse, people with kidney disease might also be at higher risk for drug accumulation, toxicity, and theoretically overdose. Opioids undergo varying degrees of hepatic metabolism and are renally cleared. In kidney disease, both parent opioids and their metabolites have the potential to accumulate resulting in higher endogenous exposure. Observational studies in the dialysis population have associated opioids with higher risk of death, hospitalization, altered mental status, falls, and fractures. It is our job, as the nephrology community, to promote awareness of how the opioid epidemic continues to affect our patients. We should work with opioid prescribers and ensure opioid doses are reduced and spaced as eGFR falls. It is our job to educate our patients about the risks of opioids and how their risks might be higher than people without kidney disease. Perhaps, it is also our job to ensure that our patients with opioid prescriptions have access to Narcan and have identified someone who can use it in the event of overdose. 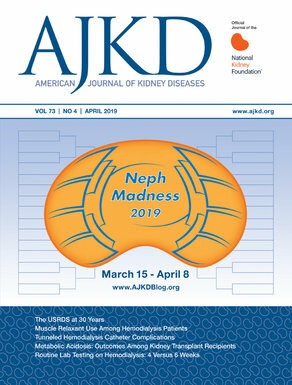 Concisely put, this is an important topic for the care of our patients, and that is why my pick for NephMadness 2019 is Team Opioids.